Tonight's rehearsal has been canceled due to the weather and the cancelation of Canfield schools today. Next week's rehearsal will be at the middle school. Click here to see the repertoire for our upcoming Christmas concerts and the rehearsal plan. The document lists the dates of upcoming rehearsals and the sections of each piece that are planned for each rehearsal so you can prepare and practice on your own. Our final performance of the summer has been scheduled. The logistical problems have been worked out and we will be returning for our annual performance at the Canfield Fair on Sunday, September 4 at 2 pm in the Western Reserve Historical Village. UPDATE: the Parking Lot across Route 46 from the Western Reserve Village WILL BE AVAILABLE to band members for our Sunday, Sept 4 performance. Tell the attendant you are with the Canfield Community Concert Band performing at the Village. We will be permitted to pull up in front of the Gate at the Village and drop of instruments and equipment if need be, and the proceed to the parking lot. Band members can get stamped at the gate so that theycan re-enter the Fair. Arrive at 1:30 pm, ready to play at 2:00 pm. Dress: Blacks shorts and 40th Anniversary Red T-Shirts. UPDATE 9/2/2016, 4:30 pm: Parking at the lot on route 46 will be available for use by band members, but only for the time surrounding our performance. If you plan to re-enter the fair for the afternoon after our performance, you must move your car before doing so. The fair board has reserved parking for our use after the performance nearby at gate 9, farther south off route 46. Go to gate 9 and tell the attendants you're with the band and they will direct you to a reserved parking section close to entrance H. When you enter through entrance H, tell the ticket attendant that you're with the band and they will allow you to re-enter without a ticket or hand stamp. Although they won't require a hand stamp to re-enter at entrance H after the performance, you MAY still get one at the Western Reserve Village if you plan on re-entering somewhere else, or if you will be re-entering later in the day. Band members, music folders will NOT be collected at the fair. Rehearsals will start up again on September 13 and we will exchange folders at that time. If you do not plan on returning for the fall, please do give your folder to Bethany or Tony at the fair or make arrangements to return it later. 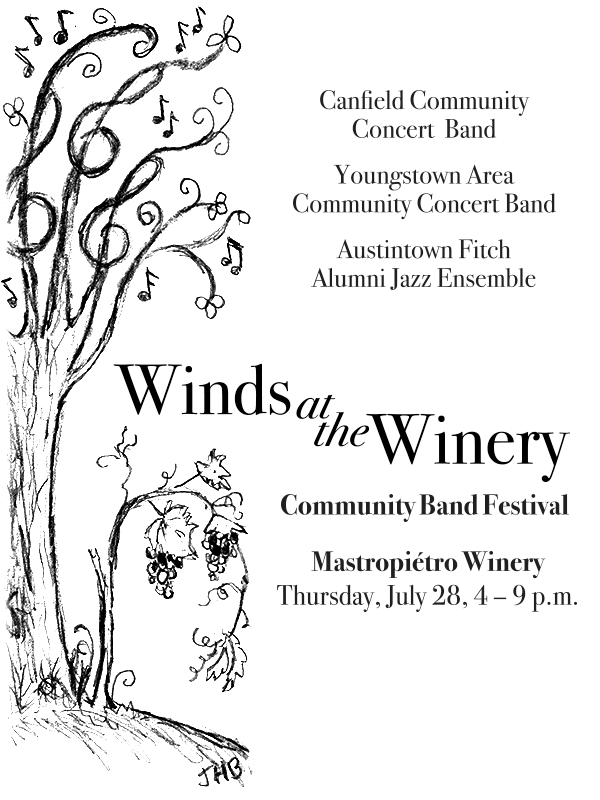 We are pleased to present the first annual Winds at the Winery Community Band Festival! Food and Wine* will be available for purchase throughout the event. Performances by small woodwind and brass ensembles will provide musical entertainment on the patio from 4:15 - 5:45. Performances by the Canfield Community Concert Band, Younstown Area Community Concert Band, and Austintown Fitch Alumni Jazz Band will start at 6. The evening will conclude with a combined performance of Stars & Stripes Forever by all three bands. There will be a 50/50 drawing and a basket raffle, and donations will be accepted, all to benefit Lifebanc in support of Organ, Eye, and Tissue donation. Wine will be available for purchase from the winery and food and snacks will be available from food trucks or the winery. You may bring your own food, however Ohio law prohibits anyone from bringing alcoholic beverages onto Winery property. Picnic tables and chairs will be available on a first come first serve basis, but you are welcome to bring lawn chairs or blankets and sit on the lawn.